Olympic Valley, CA – Few things are more rewarding than conquering a climb and earning your turns all the way down. 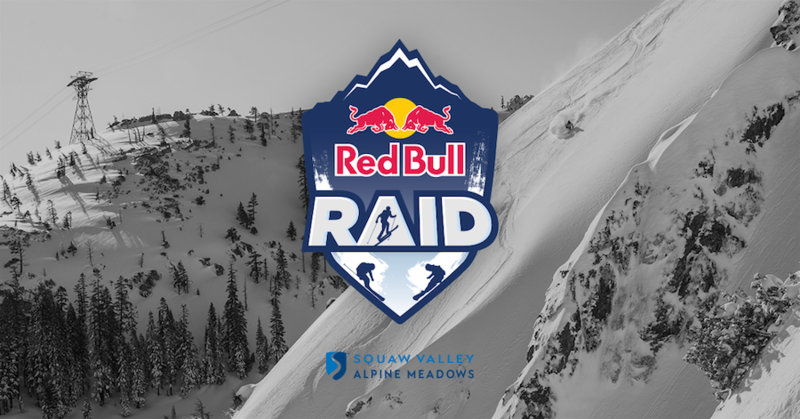 At Red Bull Raid on April 13, competitors will be challenged to do just that while being judged on speed and skill in Squaw Valley’s Silverado area. The competition is composed of two parts: ski touring or splitboarding up and then the descent on the same equipment. Limited to 60 total competitors, the categories include men’s ski, men’s splitboard, women’s ski and women’s splitboard. Each run can score a maximum of 200 points: 100 for the climb and 100 for the descent. The first competitor to reach the top in each category will score the maximum 100 points for the climb. Each position after that will be an incremental deduction of one point. The descent will be scored by a panel of three judges on three categories: style, line and control. The competitor fee is $50, and prizes of cash and other big-ticket items will be awarded to the first, second and third place finishers in each category. Skiing and riding spectators are welcome to attend and support the area’s most talented athletes while celebrating Squaw Valley’s legacy of pushing the extremes on snow. While we know competitors will be taking on formidable terrain, the specific location of the competition venue within the Silverado area will be determined based on weather and conditions prior to the event. Event registration and additional information can be found here. Redbull.com is a multi-platform media platform with a focus on sports, culture, and lifestyle. Winner of the 2017 Google Play award, Red Bull TV features beyond the ordinary live events and videos featuring inspirational stories. Anytime, anywhere.